On March 24, 2001, Apple released the first version of its Mac OS X operating system, noteworthy for its UNIX architecture. OS X (now macOS) has been known over the years for its simplicity, aesthetic interface, advanced technologies, applications, security and accessibility options. From the Finder to Spotlight, the Dock to iCloud, the operating system has been integrated into Apple's hardware, as well as iOS devices, so users can easily work and navigate. 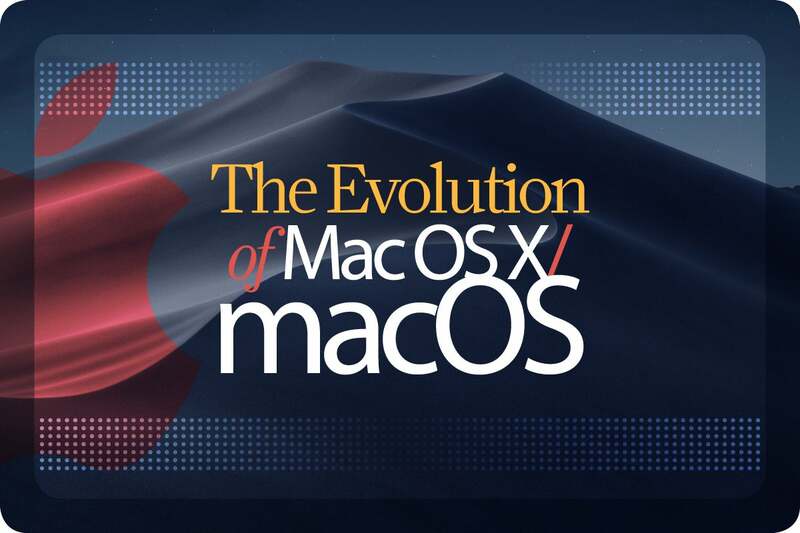 OS X/macOS has become a brand identity for both Apple and its Mac lineup and has broadly evolved over the years, even taking some of its shape from Apple's later launch of iOS, its mobile operating system. For more about Apple's desktop OS, check out "15 years of OS X: How Apple's big gamble paid off." 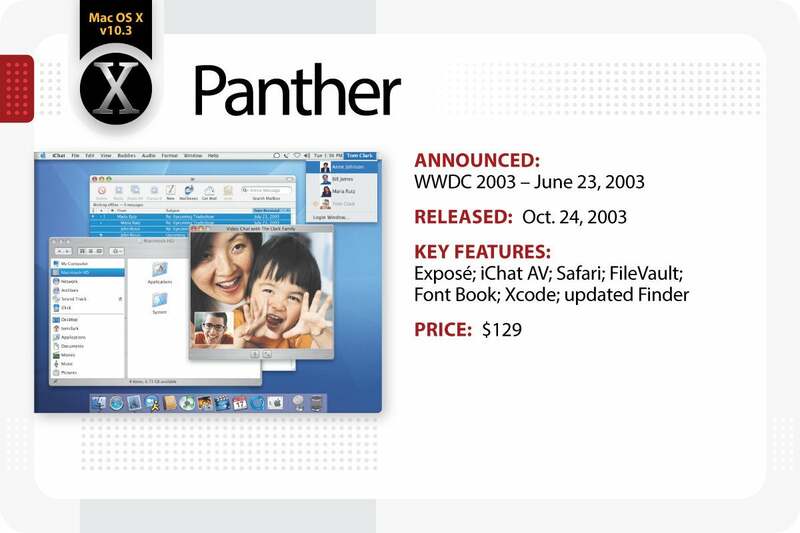 Apple announced OS X Panther at WWDC 2003. It included Exposé, a useful feature that let users instantly view all open windows at once, view windows of a current program or just view files on the desktop. 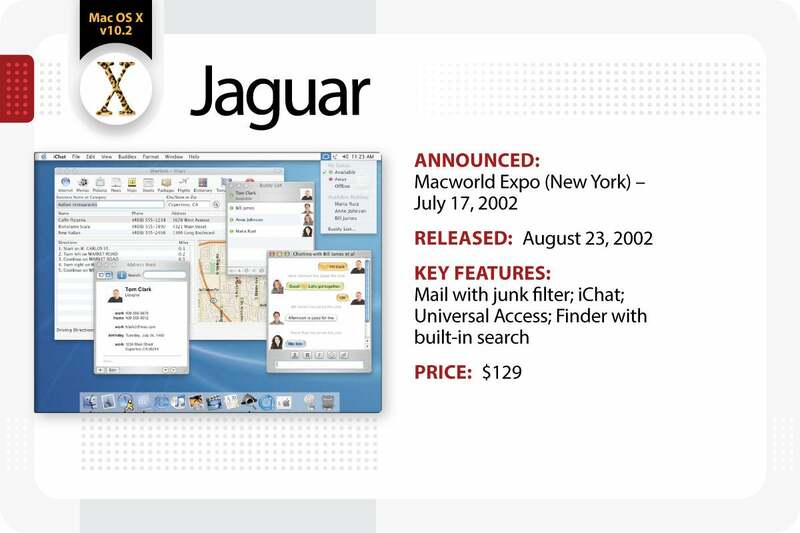 iChat AV let users communicate with audio and video as well as text, and Safari became the Mac’s default web browser after it dropped support for Internet Explorer for Mac. OS X 10.3 also introduced FileVault to encrypt hard drive data with 128-bit keys; Font Book, Apple’s simplified application for managing system fonts; Xcode, Apple’s developer tool to build Mac applications; and a revamped Finder with sidebar for easy access to disk drives, networks and folders. 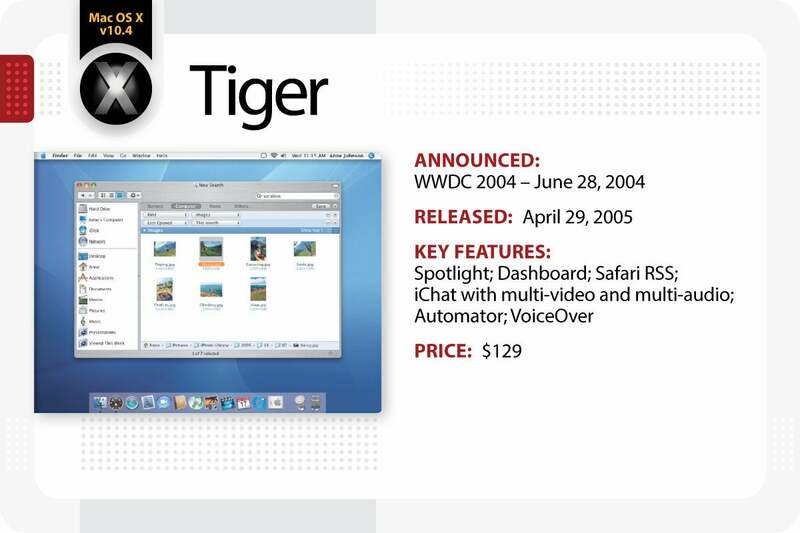 OS X Tiger was introduced at WWDC 2004. 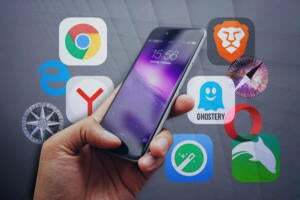 It included a universal search client, Spotlight, which allowed users to search their entire system from the menu bar for files, emails, contacts, images, calendars and applications. Dashboard featured widgets for weather, flight information, stock tickers and more. Safari included RSS features and iChat supported up to four participants in a video conference or 10 participants in an audio conference. OS X 10.4 also introduced Automator, an application that automated tasks and workflows such as renaming large groups of files or resizing dozens of images; and VoiceOver, an accessibility interface that provided magnification options, keyboard control and spoken English descriptions of what’s happening on screen. 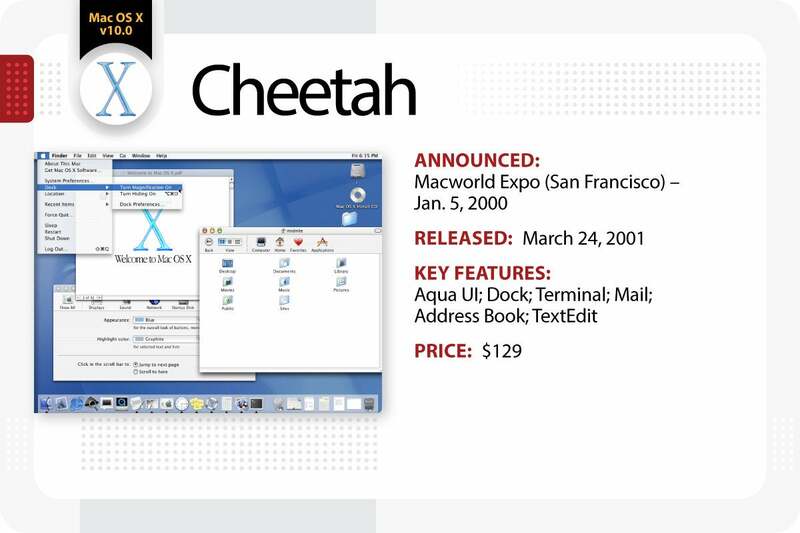 OS X Tiger became the first OS to support the Apple-Intel architecture after Apple's transition to Intel x86 processors, and it became the longest running version of Mac OS X prior to Leopard's release 30 months later. 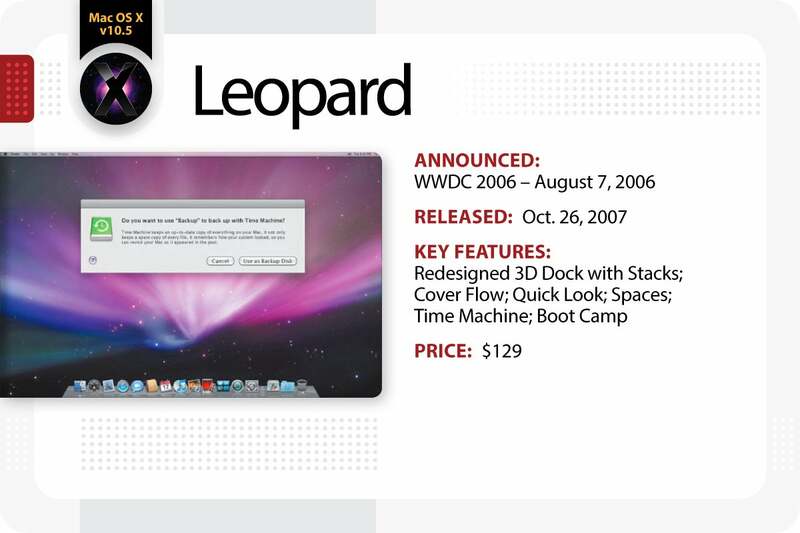 Apple introduced OS X Leopard at WWDC 2006, and it became a redefining moment for its software, since it was noted to be the "largest update of OS X." It featured a modernized look with a three-dimensional, reflective Dock, a semitransparent menu bar, larger drop shadows for active windows and new high-resolution icons. OS X 10.5 included Stacks, a grouping feature that displays files in a "fan" or "grid" style in folders on the Dock; an updated Finder that incorporates the Cover Flow visual navigation interface first seen in iTunes, iPhone and iPod touch; Quick Look, which allows a "preview" of items by hitting the space bar; Spaces, a way to group application windows on more than one virtual desktop; Time Machine, an automatic backup utility that allows users to restore deleted files; and Boot Camp, Apple's software client to run Microsoft Windows natively on a Mac. With the release of the aluminum unibody MacBook and Macbook Air with multi-touch track pad, OS X Leopard also unofficially supported multi-touch gestures. 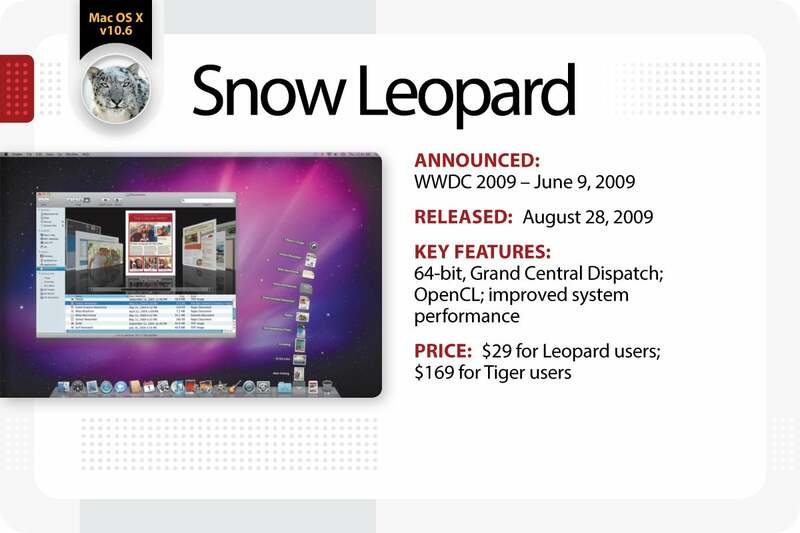 OS X Snow Leopard was introduced at WWDC 2009, and for the first time, users could buy it for a very affordable $29. This update featured all of Apple’s applications rewritten in 64-bit code; Grand Central Dispatch, a new way for software developers to write applications that takes advantage of multicore processors; and OpenCL, a C-based open standard allowing developers to tap into the power of the GPU for tasks that go beyond graphics. OS X 10.6 also built off of the previous OS (hence its name) with further enhancements such as faster disk ejecting, quicker Time Machine backup, faster boot and shut down times and faster OS installation. 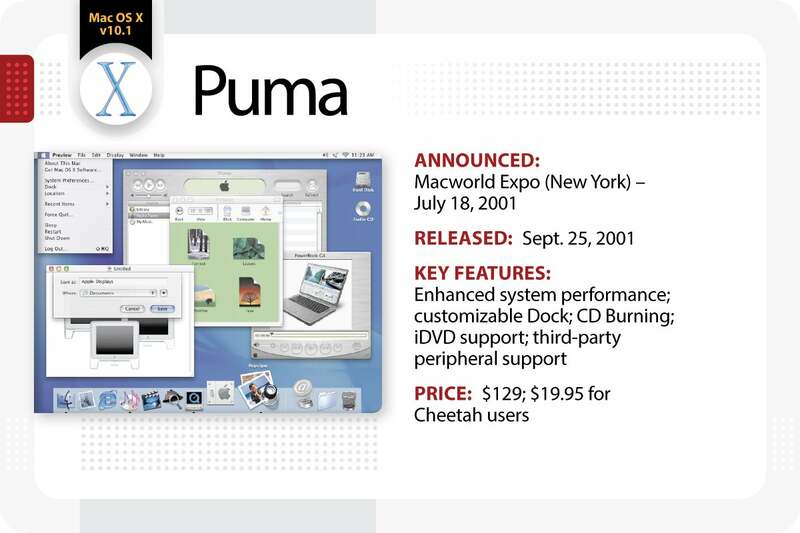 OS X Snow Leopard was significantly smaller that OS X Leapard and freed up to 7 GB of space; it also became Apple's first operating system to be Intel-only. 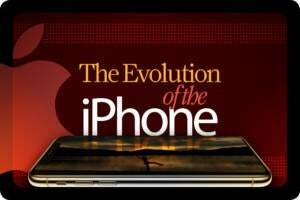 It became the second-longest running Apple OS after Tiger and the last to need a physical disc after the introduction of the Mac App Store in the Snow Leopard 10.6.6 update. 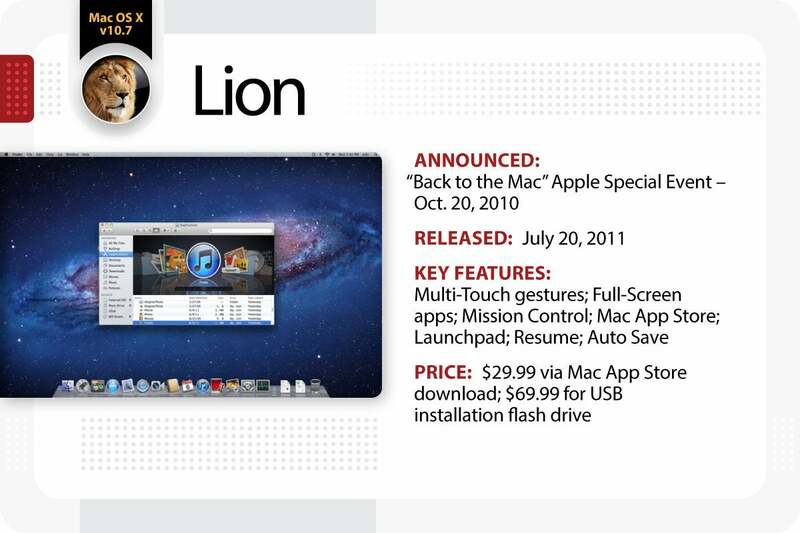 Apple introduced OS X Lion at a special event called "Back to the Mac." It officially supported multi-touch gestures with added gestures and responses such as rubber-band scrolling, page and image zoom and full-screen swiping. Apps could be full-screen for the first time, and the introduction of Mission Control combined Exposé, Dashboard, Spaces and full-screen apps to give users one place to see and navigate everything running on their Mac. OS X 10.7 brought many developments made in iOS, such as an easily navigable display of installed applications -- Launchpad -- and new thinner, gray scrollbars that disappeared when not used. 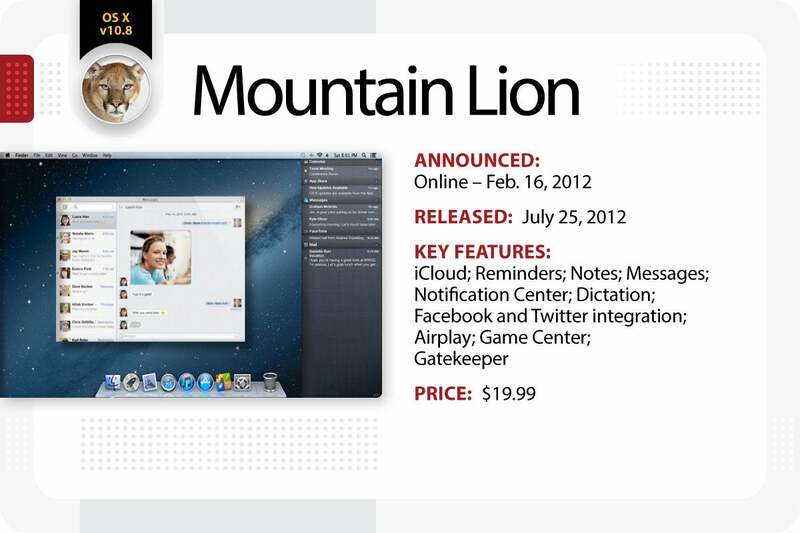 OS X Lion also included support for the Mac App Store, introduced in OS 10.6.6. Other features included Resume, which allowed apps to reopen if closed, and Auto Save. Apple introduced OS X Mountain Lion at WWDC 2012, and from then onward dropped the "Mac" prefix from all references of OS X on its website. iCloud synced mail, calendars, contacts, reminders, documents, notes and more between Macs, iPads, iPhones and iPod touches. Apps from iOS devices were also brought over: Reminders, Notes and Messages, which brought iMessage to the Mac for the first time; Notification Center alerted users to new emails, messages, software updates or calendar alerts; Dictation converted words into text; and a new Sharing button allowed the sharing of photos, videos, files and links with Mail, Messages and AirDrop. OS X 10.8 integrated Facebook and Twitter so users could set up and manage their accounts right in System Preferences. AirPlay Mirroring enabled easy sharing from a Mac to an Apple TV, and Game Center brought games from iOS to the Mac. Finally, Gatekeeper helped protect users from downloading and installing malicious software to their Macs by only permitting users to install apps from the Mac App Store and other identified developers. Users could download this update for a slimmer price at $19.99. 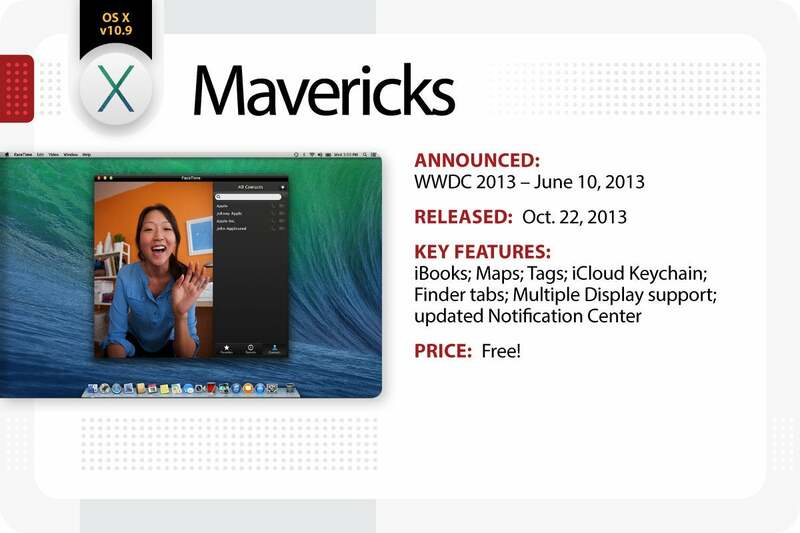 Apple introduced OS X Mavericks at WWDC 2013. It replaced its big cat naming convention with places in Apple's home state of California; thus Mavericks was named after a popular surfing spot. OS X 10.9 introduced iBooks from iPad, Maps from iOS that enabled users to send directions from their Mac directly to their iPhone, and Tags, a new way to organize and find files by labeling them via colors or particular naming conventions; iCloud Keychain stores, encrypts and automatically enters passwords; the Finder can support tabbed browsing for further productivity and support for working on multiple displays with menu bars and dock; and Notification Center allows users to interact with alerts, such as replying to an iMessage. Icons were also redrawn double their size for the new MacBook Pro with Retina Display. For the first time ever, Mac users could update to the latest Mac OS for free. 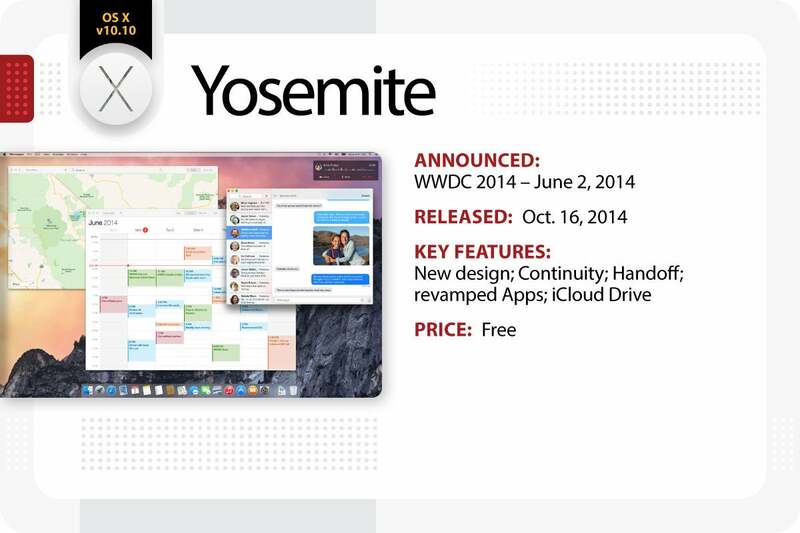 Apple announced OS X Yosemite at WWDC 2014. To match the design overhaul of iOS 7, OS X Yosemite discarded the skeumorphic interface it had used for over 10 years. The update included a flat graphic design, blurred translucence effects, a two-dimensional Dock that iterated the one used in Tiger, updated icons, light and dark color schemes, and the first time ever replacement of the default system typeface from Lucida Grande to Helvetica Neue. With Continuity, Macs could now receive and make calls from an iPhone on the same Wifi network. Macs could also send and receive SMS text messages, and iCloud synced all iMessages and text messages between a Mac and an iOS device. OS X 10.10 included Handoff, which allowed users to write an email or browse Safari while moving seamlessly from a Mac to an iPhone or iPad and vice versa. The new Photos app replaced iPhoto and integrated photos from iCloud or an iOS device into one place. Mail allowed marking up attachments right in the app, and Mail Drop allowed users to send large files (up to 5GB) without having to worry about an email client's limitations. Finally, iCloud Drive let users store all types of files in one place and access them from any device. 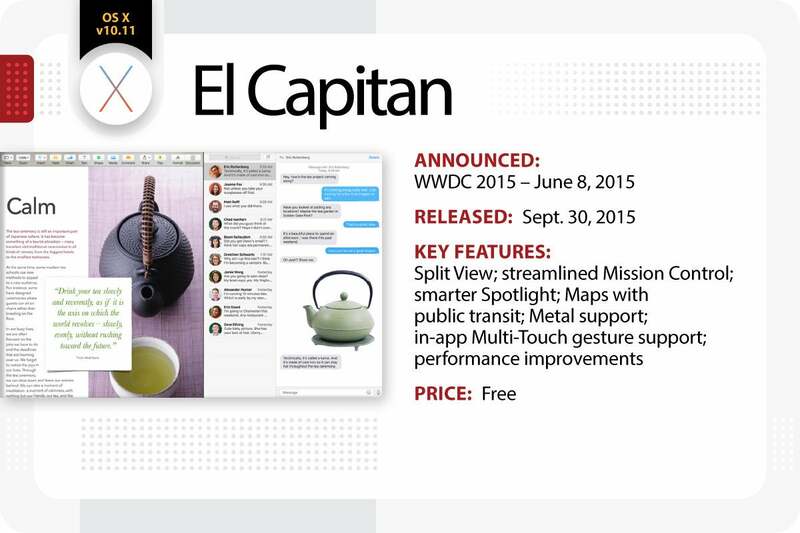 OS X El Capitan was announced at WWDC 2015. It enhanced the design and usability of OS X Yosemite with performance and security improvements. Features included Split View, which placed two full screen apps side by side; a streamlined Mission Control, which made it easier to see all open windows in one place; a smarter Spotlight that delivered results for weather, sports, stock, web, video and transit directions and can deliver information using natural language; a refreshed Maps app that included public transit information for some U.S. cities; Metal, a new graphics core technology that gave games and apps almost direct access to the Mac's graphics processor for better performance; in-app Multi-Touch gesture support; and system-wide performance improvements for further responsiveness and efficiency when using apps. A new font called San Francisco used on iOS devices running iOS 9 and Apple watches running watchOS also replaced Helvetica Neue that debuted on Yosemite. 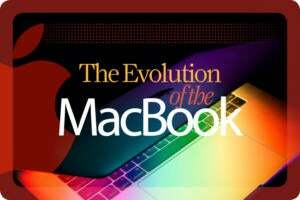 For more about Mac OS X, check out "15 years of OS X: How Apple's big gamble paid off." 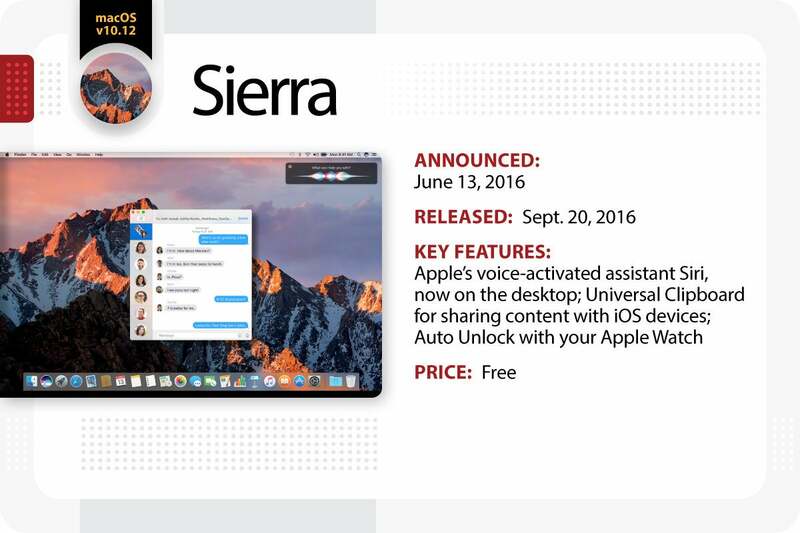 The renamed macOS Sierra debuted at WWDC 2016 and after a public beta program over the summer rolled out in finished form on Sept. 20. Sierra brought a variety of changes, most notably the arrival of Siri on the Mac desktop. Users could access Siri in the upper right-hand corner of the menu bar between the Notification Center and Spotlight menu icons, a Dock icon, the menu bar icon or a hot key. The voice-activated assistant could help users find files, get quick access to information like the weather or perform searches, with search results that could be saved and pinned to the Notifications area. 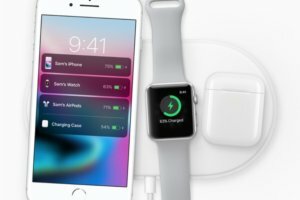 Other changes in Sierra included a Universal Clipboard, which allowed text to be copied from one Apple device to another; iCloud Desktop and Documents, for syncing data across Macs using the cloud; Auto Unlock, which allowed the Apple Watch to unlock a macOS account; and Apple Pay on the web. Photos received a new Memories feature that automatically created curated collections of users' favorite photos and videos. Sierra also delivered more than 60 security fixes. 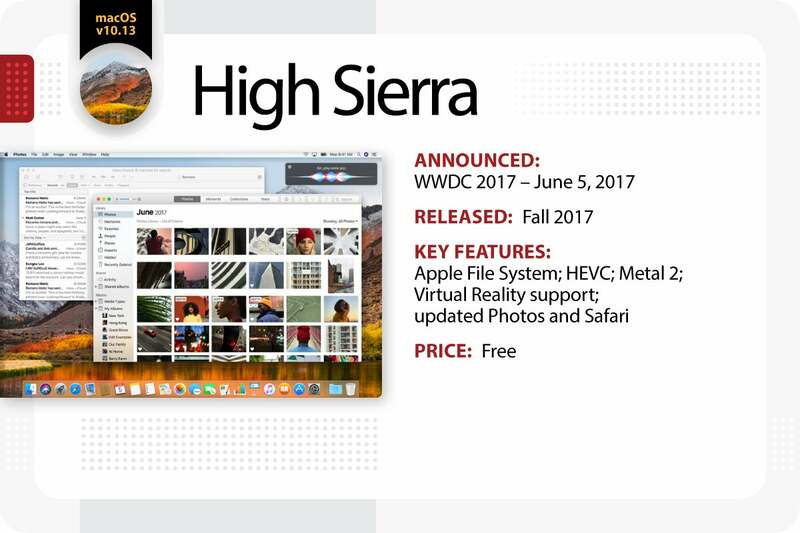 Introduced at WWDC 2017, macOS High Sierra is an iterative update to macOS Sierra, and its name is an ode to California’s Sierra Nevada mountains. This version introduces Apple File System to efficiently manage data for better performance as well as a new industry standard for 4K video -- High Efficiency Video Coding, also known as HEVC or H.265. Metal 2 furthers graphics capabilities and natural language processing, and developers will be able to create interactive virtual reality experiences on a Mac for the first time. A refreshed Photos app makes searching for and organizing photos easier and contains advanced editing tools. Safari becomes faster and contains new features like Intelligent Tracking Prevention to remove cross-site tracking data from advertisers. Safari also automatically disables those annoying autoplaying videos with audio for a quieter browsing experience. 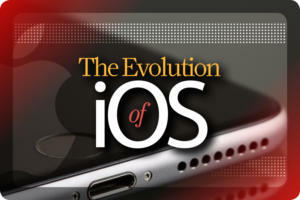 Other features include improved Siri and Spotlight and instant iCloud syncing for Messages. It will be available as a free download on Sept. 25. Apple announced macOS Mojave at WWDC 2018. Its main feature is a new Dark Mode that turns the overall UI dark gray. (A new interactive wallpaper can also adapt to the time of day based on a user’s location.) The new Stacks feature organizes cluttered desktops by automatically stacking similar files into groups, and Gallery View – reminiscent of Cover Flow – lets users visually skim through files. Preview Panes show file metadata, and Quick Look allows users to rotate, crop and mark up PDFs and trim video clips without opening native applications. The News, Stocks, Voice Memos and Home apps from iOS arrive on the desktop; Group FaceTime allows up to 32 users on a simultaneous video chat; and the Mac App Store gets a fresh design. Security enhancements via Safari’s Intelligent Tracking Prevention block user tracking without permission. The screenshot tool contains new on-screen controls to mark up images and allows users to record video. Continuity Camera permits users to take a picture or scan a document with an iPhone or iPad and have it appear instantly on their Mac. Integrated markup tools for Finder, Quick Look and Screenshots also make adding comments fast and easy. 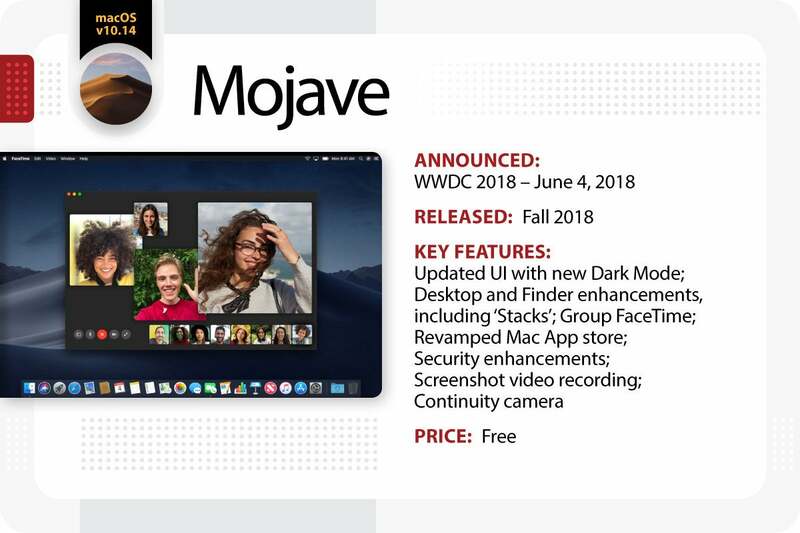 macOS Mojave will be available this Fall as a free update for Macs introduced in mid-2012 or later and for 2010 and 2012 Mac Pro models with recommended Metal-capable graphics cards.